Secure your wetsuit, clothes, tech and more, in this anti-theft carry-on bag. 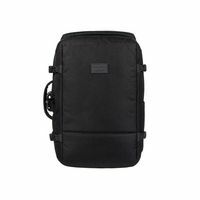 Featuring a removable dry bag, heavy-duty tarpaulin pockets and heaps of storage space, the QUIKSILVER X PACSAFE 40L carry-on pack is designed with boardriders in mind. Adjustable straps and ergonomic back padding add additional comfort when carting your gear on and off the beaten track, while anti-theft technology helps protect your things while you focus on what really matters.